This is the play by play of the previously posted story mode. We’ve had this game for a while, but we haven’t had an opportunity to play it. This type of game isn’t really Space Cat’s thing, and we don’t want to make her feel left out. Since Space Cat wasn’t here, we pulled out Story War. 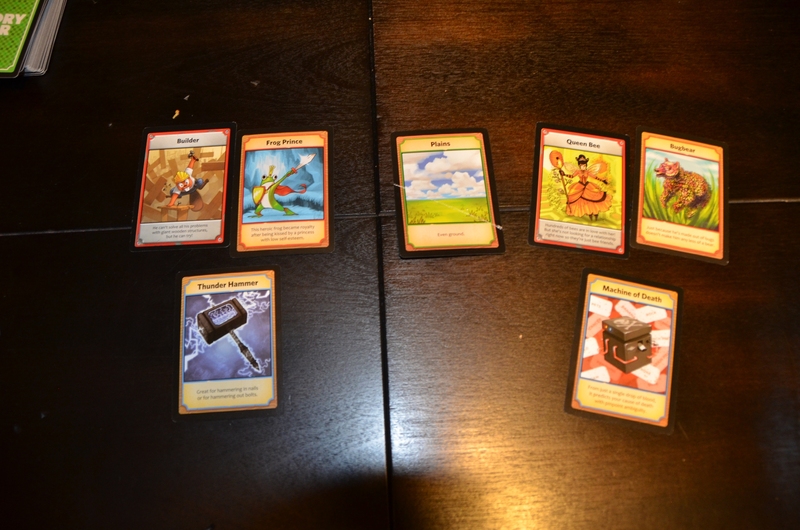 Initial cards: Chubby Unicorn and Clumsy Ninja played the Builder and the Frog Prince. Shutter and President Gamer played the Bugbear and the Queen Bee. Arguments: The Builder made a fort for the Frog Prince, and Thor’s Hammer destroyed the device and turned the fort in to a giant bug zapper, killing the Bugbear and Queen Bee.